T cells (T lymphocytes) derive their names from the organs in which they develop in the thymus. They arise in the bone marrow but migrate to the thymus gland to mature.The diverse responses of T cells are collectively called cell-mediated immune reactions. This is to distinguish them from antibody responses, which, of course, also depend on cells (B cells). T cells cannot recognize antigen alone, as for T cell receptors (TCRs), they can recognize only antigen bound to cell-membrane proteins (MHC molecules). TCRs have different structures thus they bind to different molecular structures and have different genetic codes. Like antibody responses, T cell responses are exquisitely antigen-specific, and they are at least as important as antibodies in defending vertebrates against infection. Indeed, most adaptive immune responses, including antibody responses, require helper T cells for their initiation. Most importantly, unlike B cells, T cells can help eliminate pathogens that reside inside host cells. According to the function and surface marker, T cells can be divided into four main classes. Cytotoxic T cells directly kill infected cells by inducing them to undergo apoptosis, these cells like a "killer" or cytotoxin because they kill cells of interest that produce a particular antigen. The major surface marker of cytotoxic T cells is CD8, also known as killer T cells. 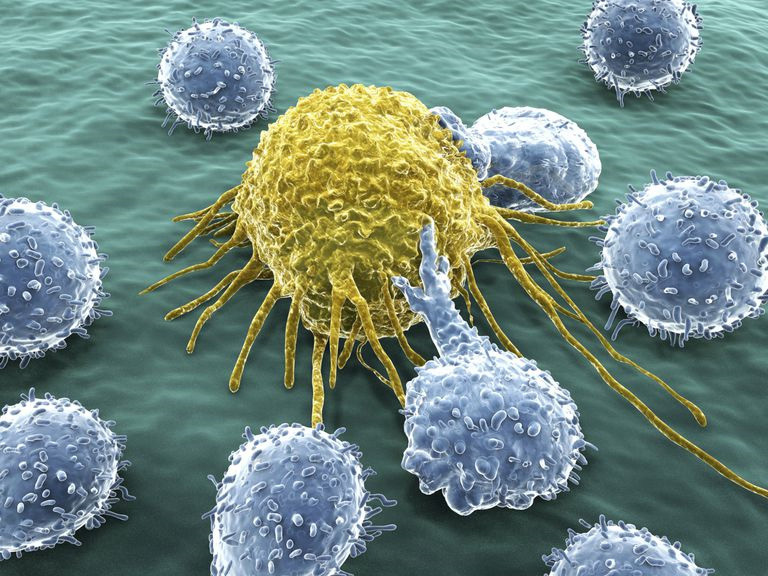 Helper T cells play an intermediate role in the immune response. They proliferate to activate B cells to make antibody responses and macrophages to destroy microorganisms that either invaded the macrophage were ingested by it. Helper T cells also help activate cytotoxic T cells to kill infected target cells. Helper T cells themselves, however, can only function when activated to become effector cells. The major surface marker of helper T cells is CD4. Memory T cells consist of both CD4 and CD8 T cells that can rapidly acquire effector functions to kill infected cells and/or secrete inflammatory cytokines that inhibit replication of the pathogen. Together with memory B cells, lymphocytes that store specific antigen messages after antigen stimulation have lifespans of up to several decades. When they receive the same antigenic stimuli as they once again, they can proliferate as functional T cells against antigen or plasma cells that produce antibodies. Regulatory / suppressor T cells often play an important role in maintaining their own tolerance and avoid excessive damage to the immune response to the body. There are many classes of regulatory / suppressor T cells, including CD25 and CD4 T cells. They can inhibit T cells and B cells to regulate and control the immune response and maintain immune self-stability. In the thymus, developing T cell, known as thymocytes, proliferate and differentiate along developmental pathways that generate functionally distinct subpopulations of mature T cells. Aside from being the main source of all T cells, it is where T cells diversity and then are shaped into an effective primary T cell repertoire by an extraordinary pair of selection processes. Cell differentiation is essential to create multiple subsets. Differentiation of naïve T cells into effector cells is required for optimal protection against different classes of the microbial pathogen and for the development of immune memory. Differentiating cells undergo programmed alterations in their patterns of gene expression, which are regulated by structural changes in chromatin. Differentiation is also directed by instructive and licensing signals from the environment, especially from antigen-presenting cells (APC). These cells gauge the class of the ingested microbe and generate signals that direct naïve T cells to differentiate into the subset that mobilizes the appropriate immune defense mechanisms. It is widely believed that cytokines are the major drivers of differentiation. However, a purely cytokine-driven model is difficult to reconcile with evidence that antigen presentation and delivery of differentiation signals occur by one and the same APC. Therefore, a critical role may exist for short-range acting factors, such as cell surface molecules. The past decade has seen the discovery of an ever-growing number of CD4 T helper cell subsets, with unique transcriptional programs governed by lineage-defining transcription factors. CD4 T helper cell subsets, known as T helper 1 (Th1), Th2, Th9, Th17, and Th22, each produce specific cocktails of cytokines to coordinate immunity to distinct types of microorganism. Follicular T helper cells (Tfh) specialize at helping B cells, while induced regulatory T cells (iTregs) suppress detrimental immune responses. Finally, a differentiation step is required to make T cells that contribute to immediate rejection of microbial infection, as well as others that develop into memory cells. T helper type-1 (Th1) cells characteristically transcribe the T-bet transcription factor and produce interferon gamma (IFNg), interleukin-2 (IL-2), and lymphotoxin genes, whereas Th2 cells express the IL-4, IL-5, IL-6, IL-10, and IL-13 genes. Both Th1 and Th2 cells appear to derive from a common naive precursor cell whose differentiation pathway is determined by cytokine and costimulatory signals during primary antigenic stimulation. Specifically, Th1 differentiation is driven by IL-12 and requires the IL-12-responsive transcription factor STAT4, while Th2 differentiation is elicited by IL-4 and requires the IL-4- responsive transcription factor STAT6. In vivo, progressive polarization of the cytokine response occurs in response to chronic antigenic stimulation as a result of the self-amplification and negative cross regulation inherent in T cell differentiation. Th1 cells direct immunity against intracellular bacteria and viruses and have been implicated in a host of autoimmune conditions. However, Th2 cells do develop in helminth-infected mice even if IL4 receptor signaling has genetically been disabled, demonstrating the existence of other pathways that induce this differentiation program in vivo. Th2 cell responses were also reduced by GSI in a model or asthma. CD8 T cell proliferation is dependent on repeated encounters with antigen. Each cell that is stimulated by antigen divides and progressively differentiates into effector cytotoxic T lymphocytes (CTLs) then memory CD8 T cells with each successive cell division. The initial antigenic stimulus triggers this developmental programme, such that the CD8 T cells become committed to proliferation and differentiation. Further antigenic stimulation of the daughter cells might increase the number of times the activated CD8 T cells divide, but it is not necessary to complete this developmental programme. The programmed development of CD8 T cells has several advantages. First, it alleviates the need for prolonged confinement of CTLs to the lymphoid organs, which allows their migration to peripheral sites of infection and/or inflammation to remove infected cells. Second, it might also considerably affect the number of memory CD8 T cells that are generated, because the size of the memory T cell pool is directly correlated to that of the effector-cell population1–3. In several models of acute viral and bacterial infection, the number of effector CD8 T cells peaks 2–3 days after the infectious pathogen is cleared. If each CD8 T cell division was regulated strictly by antigen contact, the number of effector CTLs would peak earlier and reach a lower maximum, and consequently, fewer memory CD8 T cells would be generated. The development of effector T cell responses is tightly coupled to clonal expansion. Studies have shown that the link between the commitment to clonal expansion and effector-cell differentiation is remarkably tight; the same duration of antigenic stimulation (2–24 hours) that drove naïve CD8 T cells to proliferate was sufficient for them to commit to differentiate into effector cells, tumour-necrosis factor (TNF) and IL-2, and kill infected cells. Helper T (Th) lymphocytes undergo two spatially and temporally distinct phases of differentiation. Following the first developmental phase, which occurs in the thymus, a second phase triggered by the initial encounter with antigen in the periphery leads to the development of effector T helper cell subsets displaying mutually exclusive patterns of cytokine gene expression. Clinically, Th1 patterns of cytokine production are associated with inflammation and autoimmune disease while Th2 patterns are characteristic of allergic responses and asthma. Such as systemic lupus erythematosus (SLE), it is an autoimmune disease with unknown etiology affecting more than one million individuals each year. SLE is characterized by B and T cell hyperactivity and by defects in the clearance of apoptotic cells and immune complexes. Understanding the complex process involved and the interaction between various cytokines, chemokines, signaling molecules, and pattern-recognition receptors (PRRs) in the immune pathways will provide valuable information on the development of novel therapeutic targets for treating SLE disease. If you have any additional questions, please contact us at . Kaech, S.M. ; et al. Effector and memory T-cell differentiation: implications for vaccine development. Nature. 2002, 2(4): 251-62.